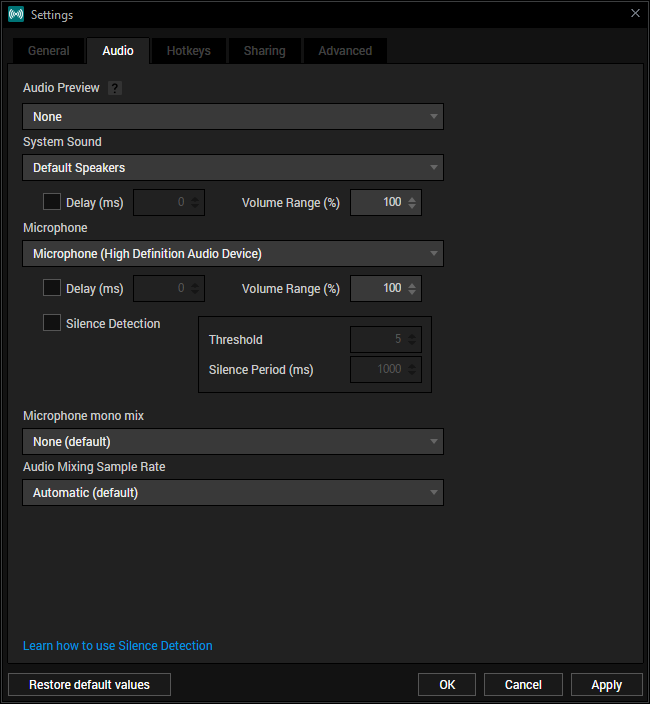 The Audio tab is where you can set which devices XSplit Broadcaster capture audio, set audio capture delay and volume control range as well as enable features such as audio preview and microphone silence detection. Choose an audio playback device to monitor the final audio output from the presentation. Choose an audio playback device that XSplit Broadcaster will capture audio from. Enable and set a delay from which XSplit Broadcaster captures audio from the above device. Choose an audio recording device that XSplit Broadcaster will capture audio from. Enable/disable automatic muting of the microphone within the set threshold and silence period. More information below. Sets how audio from a mono microphone source will be distributed to the left and right audio channels. Allows you to manually select the sampling rate of your final audio output. Useful for those that a specific sampling rate for their recordings or output sources or matching the sampling rate of legacy audio devices that cannot accommodate 48KHz. Enabling microphone silence detection allows you to limit unwanted background noise by automatically muting the microphone. The threshold set allows you to control the minimum volume level of sound to automatically unmute the microphone while the silence period is the amount of time before the microphone is muted again. To learn more about Silence Detection and how to use it, click here.